In my first six months of office, I laid the foundation for an agenda that is focused on a “back to basics” approach. It prioritizes the basic delivery of those city services and policies that improve our neighborhoods – including the creation of more sustainable, walkable, and transit-connected communities. In the U.S., 81 percent of our people now live in urban areas — a number that has grown in recent times. In California, 95 percent of us live in cities. Mobility is the lifeblood of cities. The ability to move people and goods allows us to compete for jobs with cities across the global economy. On my first trip to Washington D.C. as Mayor, I met with President Barack Obama and with U.S. Secretary of Transportation Anthony Foxx to advocate for nearly $2 billion of transit funds from a federal program called New Starts. These funds would help pay for the construction of the Regional downtown Connector and the first phase of the Purple Line projects. They will transform Metro’s growing transit system, making it easier for riders to reach jobs and popular destinations along Wilshire Boulevard, to and from downtown and across Los Angeles — the underground Connector will tie together the Blue, Expo, and Gold lines for a one-seat ride connection. Still, nationwide, New Starts was scheduled to invest about $2.1 billion this fiscal year to 27 transit projects. It’s not enough. The money is spread too thin. Congress must do more. That begins with finally passing a multi-year transportation bill to replace the current two-year version that expires this year. The new bill should dramatically increase funding for New Starts so that there is money available to build the kind of first-class transit systems first-class cities need. And fortunately for Los Angeles and California, Senator Barbara Boxer will play a key role in helping to shape the federal transportation bill. That same bill also must provide local areas with other tools to build transportation and infrastructure. That includes federally-backed loans and bonds that are the centerpiece of the America Fast Forward program. Metro and I continue to urge Congress to pass that legislation. There’s nothing partisan about this. Business groups across the nation — from Los Angeles to New York to Atlanta — back America Fast Forward. And elected officials of all political stripes have historically sought to upgrade and reinvent our infrastructure. And in Los Angeles County’s case, we do not go to Washington D.C. with empty pockets. Thanks to the passage of Measure R – a half-cent transportation sales tax approved by 68 percent of voters in 2008 – we walk to Washington with skin in the game. But we can’t look at our watch and hold our breath for the future. The bottom line is: We need the deep pockets of the federal government now to continue America’s grand tradition of investing in itself, especially so we can reshape and redo major urban metropolises. I’m still waiting for the 710 to be completed. Will it ever be finished? The “urban transit revolution” depends on LOCAL decision makers ACTUALLY DECIDING to put PUBLIC TRANSIT FIRST, and not get “distracted” on things like “freeway extensions” (which no one except developers want! ), redeveloping bus station yards, or redeveloping 75 year old train stations! BUSES MOVE! PEOPLE MOVE! LIGHT-RAIL LINES MOVE! FOCUS ON WHAT MOVES TAXPAYING MEMBERS OF THE PUBLIC FOR ONCE! Since the City of Los Angeles has benefited the most from the Measure R funds isn’t time that the City of Los Angeles impose a Transit District on its self so it can contribute to the cost of these rail projects so other cities in the county can benefit from some rail lines too? PLEASE permit animals to ride the metro, it is so very important. In an op-ed for Metro – the LA County Metropolitan TRANSPORTATION (not Transit) Authority – Garcetti mentions transit 6 times, but mentions bicycle infrastructure and bicycling not even once. World class bicycle infrastructure is significantly more efficient and cost effective than transit. Transit cannot transform the daily lives of huge numbers of people the way that world class bicycle infrastructure does. 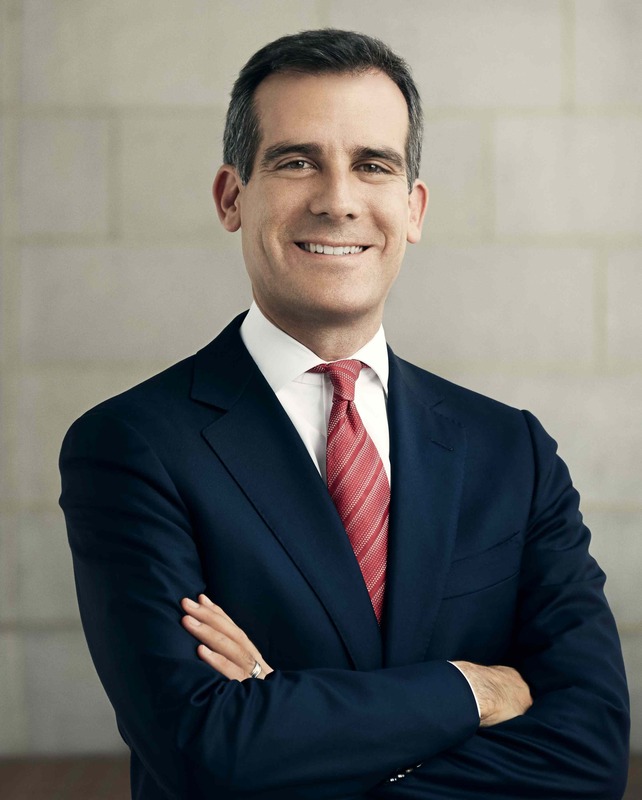 If your solution doesn’t cost many Billion$, it seems Garcetti is not interested – why not? If bicycle riding is so “efficient”, WHY do MTA buses and rail lines accommodate bicycles? Clearly you must be in favor of getting rid of bicycle racks on MTA buses, and keeping bikes OFF of MTA rail cars (a position I would LOVE to see implemented!). Keep the bicyclists on their bikes, and OFF the buses and trains (they SLOW THEM DOWN! ).